along with 165 cards containing stories about dogs and cats, from their viewpoint! 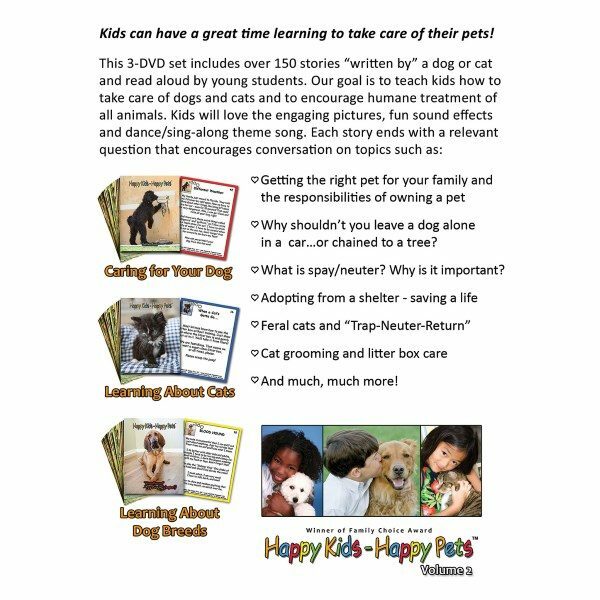 Our DVDs, “Caring for Your Dog“, “Learning About Cats“, and “Learning About Dog Breeds“, feature stories “written” and “read aloud” by dogs and cats – and since children relate well to animals, they can learn the important lessons discussed in the stories. There are 165 stories in the three-DVD set that teach the basics of compassionate treatment and care of dogs and cats. Dogs and cats need lots of love, understanding, and attention – and that’s just the beginning! These cards share dog/cat-care tips such as the importance of spay/neuter, keeping your pet safe and healthy, getting the right pet for your family . . . and more . 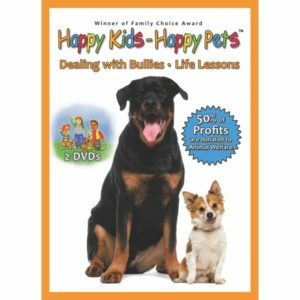 . . to help kids (and adults) have a happy life with their pet. On each card there is a precious, often funny, portrait of a dog or cat, along with a less than one minute “Read-A-Long Story Lesson.” Kids can read the cards while following along with the audio or just listen, either alone or with others. The messages truly come to life with wonderful sound effects. The children can spend hours watching the pets and listening to the stories and making “best friends” with a lot of pets!